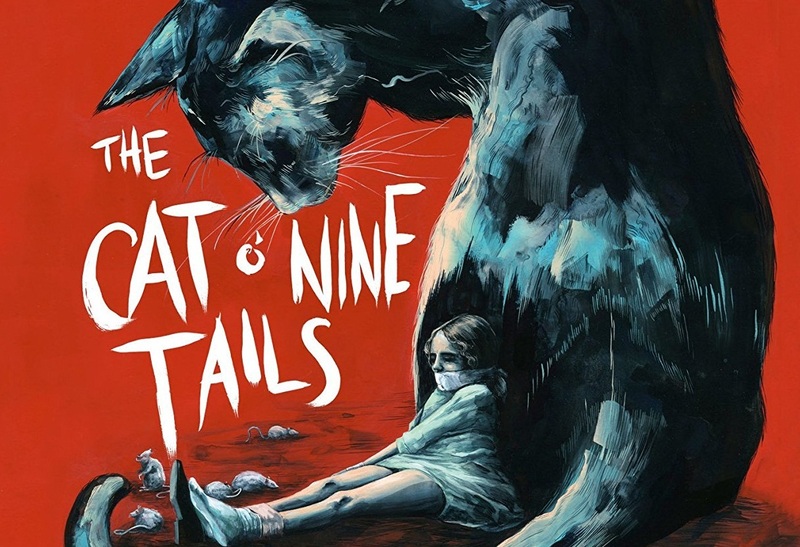 Adam takes a look at Arrow Video’s Blu-Ray release of Dario Argento’s second film The Cat ‘O Nine Tails starring Karl Malden and James Franciscus. Everything about Argento’s The Cat O’ Nine Tails, the second film, shows improvement over his much-loved The Bird with the Crystal Plumage, his directorial debut. Though similar elements do shine through, anyone who thinks the director is copying himself just isn’t looking hard enough. The Cat O’ Nine Tales is Argento at his very best; lean, economical and straight ahead. His direction is without the sort of nightmarish imagery and dream logic that would play out (or plague in many instances) his work Post-Suspiria. Blind ex-Reporter Cookie (Malden) makes his living by making Crossword Puzzles hears something that piques his interest about blackmail while walking with his young ward. After a report in the paper that confirms his suspicion that foul play is afoot, Cookie finds Carlo Giordani (Franciscus), the beat reporter on the case. The two together with the aid of Cookie’s ward Lori (Cinzia De Carolis) begin to attempt the murders of scientists that may be connected to something greater. Argento is still playing with the Poliziotteschi conventions not yet having gone fully into Giallo yet. It’s the combination and balance that creates such a compelling and fascinating watch. The director understands the mystery at the center of the film is perfectly suited for the hybrid he’s playing with. Here the mystery matters as much as the kills. The story is fuller, richer and more accomplished for this balance. The film is aided greatly by the casting of Karl Malden and James Franciscus as Report Duo that begins to solve the mystery of who, and why of the murders of the Researchers on the cusp of some truly (at the time) forward thinking and controversial discoveries. Malden is fantastic as Cookie. The actor seems to be invigorated by working with Argento in a such a different role. Rare did Malden get a chance to play the hero and it perfectly suits him. Franciscus is good as the reporter that was obviously modeled after Robert Redford in All the President’s Men. How Argento wraps up the movie is masterful and truly a great piece of cinema that will have one at the edge of their seat the last twenty minutes. Part of the film’s brilliance is an audience is never sure how it will all end. The Cat O’ Nine Tails is great filmmaking from start to finish. The brand new 4K restoration of the film from the original camera negative is nothing short of stunning. Arrow continues to push great transfers out into the world. The sharp transfer beautifully renders the deep blacks of the image. Nine Lives is a 15-minute interview with Dario Argento about the making of and his thoughts on The Cat O’ Nine Tails. It’s shocking that Argento does not have a lot of love for this film. The interview finds that he feels that it was “compromised” by a great many things. Some of which were its “American feel” and that he wasn’t able to use Vittorio Storaro as his cinematographer. The Writer O’ Many Tales is a 35-minute interview with co-writer Dardano Sacchetti. This is the crown jewel of the special features. Sacchetti is exactly what you would expect and want from a writer from that era of Italian cinema. It’s a hilarious interview where some of the highlights are stealing Argento’s number from an actor’s “little black book” to Argento hiring him for what was initially an Easy Rider rip off to knowing James Joyce to Dario’s father (and producer of the film) attempting to con the young writer out of money. Sacchetti tells these stories with a sort of dry wit that makes these impossibly grand tales even better. Anyone that loves Italian cinema of the 60’s and 70’s, specifically genre cinema. Child Star is an interview with Cinzia De Carolis but on the tester disc, I could not get to access the interview after several attempts it took me back to the Sacchetti interview. NOTE: After some research, I found that the Tester Disc issue has been resolved with the Production disc that. Gaillo in Turin is a 15-minute interview with Angelo Iacono, Argento’s production manager for 16 years and 7 films. Iacono discusses his time with Argento and the production of The Cat O’ Nine Tails and specifically how they filmed the infamous Car Chase scene. The Original Ending is essentially the script and production stills edited together to show what the original ending that Argento had wanted. Regardless of what Argento thinks of his own work, The Cat O’ Nine Tails remains one of the director’s best. Arrow Video has stacked this release with great special features and a beautiful transfer. Highest possible recommendations! The Cat O’ Nine Tails is out now from Arrow Video.